These designs are wonderful and they stitch out beautifully. I embroidered washcloths for each of my grandchildren, and then under the design, I used another font to do their names. I'm thinking about doing some more for Christmas. Thanks. Is there a membership for all three sites? Or are some of them seperate? To find the size just click on one of the letters. This is a beautiful set. I'm confused. I submitted for a ticket number and entered my information. Now I have a ticket number and they want the same information. Going in a circle with your help. 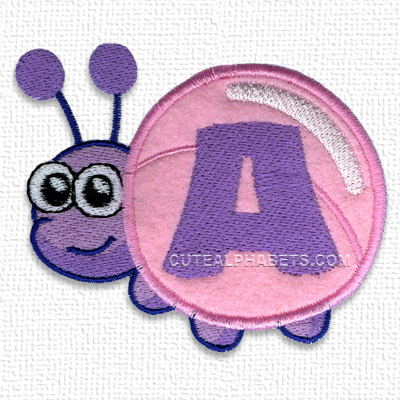 Just want to know the size of the bug applique pattern. This should not take three days to reply.